Here we will discuss how to search for your DIDs or your Inbound numbers. Direct Inward Dialing Number (DID) or Inbound numbers are the phone numbers your leads can dial to contact your agents. 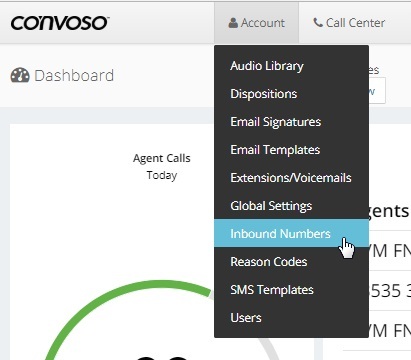 From the Admin home page, click on Accounts and select Inbound Numbers. Carrier Check - Filter phone numbers that Passed or Failed for carrier check. Country - Filter phone numbers from Australia, United Kingdom or United States. DID Type - Filter phone numbers if the DID Type is Inbound, SMS, Dial in or SMS Shortcode. Inbound Number - Filter or search the DID number. Name - Filter phone number by its name. Replacement Status - Filter phone number based on replacement status either Attempted Failed or Replacement Requested. Reputation Category - Filter phone number based on category such as Debt Collector, Lucky Winner Scam, Fraud etc. Route To - Filter phone number based on where it routes. Status - Filter phone number based on its status. (Active or Off). Once you select the filter and clicked on the Search button, the results will be listed below. In this example, we filter the search by Inbound Number and entered 9852215306 for the value.